The iPhone is a severely constrained product. We’re used to thinking that it’s production constrained—and it is, but it’s also distribution constrained. It has a business model that is almost completely dependent on operator subsidy. Few end users pay the $650 average price that Apple obtains and that price point has held for a remarkably long time. This price point is largely invisible to the user. In this regard it’s very different from all the other products Apple sells. Historically, the company has preferred having its customers to also be its users and maintained a direct relationship with them, strengthening that relationship through its own retail channel for the last decade. Pricing is used by Apple as a signal to clearly illustrate value to the user and pricing is part of the communication about the product that Apple makes very explicit. This has been true for the iPod and Mac and is still true of the iPad. But this is not so for the iPhone. The entire marketing strategy for the iPhone (and hence the entire product concept itself) is “off message”. In addition, Apple publishes the list of operators it sells through on its web site. The last time I counted I got 227 listed operators. If we contrast this with the total number of global operators (excluding MVNOs) there might be a way to measure distribution penetration. I compiled a list of all such operators based on information available in Wikipedia. You can browse the list here (Google Docs ). This global list includes 802 operators. The list is not current, being mostly based on 2009 data but it’s pretty close. I’ve read that a more recent (non-public) estimate is 816. By this measure we can say that Apple has distribution through about 30% of the total operators. Consider also that RIM reports that it sells BlackBerry through 565 wireless carriers in over 175 countries. By this metric alone BlackBerry has twice the addressable market of the iPhone. But we can do better than counting operators. We should account for the fact that some operators have more subscribers than others. 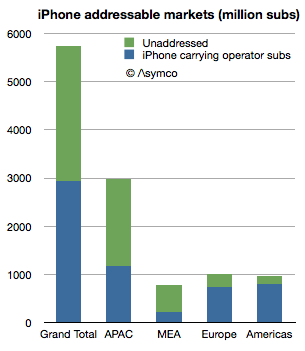 Using the same database, I measured the subscriber count of iPhone distributing carriers vs. overall subscriber count. The ratio was about 50%. iPhone “addresses” about 2.8 billion connections whereas there are about 5.7 billion available connections. Note that this is not users but subscriptions—essentially SIM cards. But the opportunity is not only in emerging markets. Japan is a 69 million subs opportunity and even the US has 80 million subs without direct (i.e. subsidized) access to the iPhone. So we can now return to the question of why the iPhone is sold the way it is. First I should point out that the addressable market of Samsung or Android in general is larger than that of the iPhone. Samsung has relationships with far more operators, at least on the scale of RIM or Nokia, perhaps even more. It might be safe to assume that Android is completely unconstrained in distribution and therefore its addressable market is the entire subscriber space (meaning that Android has twice the addressable market of the iPhone.) For Apple to compete on the basis of volume or market share it would make sense to broaden this network. So what’s holding it back? I think the answer is the other constraint mentioned: production. The company is still iterating the product on a yearly basis and needs to ramp production to reach all its carrier partners in a timely fashion. The carriers use the iPhone as differentiation and a way to uplift their core business. Therefore they want the latest version as quickly as possible. To satisfy this, Apple needs to manufacture the latest variant very quickly. But that’s not easy. Peak production is one thing but getting there quickly is another. This is the problem which Apple’s vast capital expenditures is trying to solve. At this time the answer seems to be that the model can work for about 30% of operators serving 50% of subscribers. The crucial question for the business is how much higher can these numbers get? Note that this is not a debate about market share or consumer preference but about delivering a particular value proposition to network operators, (which sustains a premium price point.) The iPhone is built around this business model and to alter it would alter the very essence of what the product is. The addressable market is one piece of the product but it interconnects with the price, margin, design, production and breadth of offering. You cannot change one without changing the others. It’s a product whose distribution model is part and parcel of its design. I believe that the particular way this product translates into a business is very rigid, which is why it has not changed much during the life of the product. This is in contrast to Apple’s other products which exhibit more market flexibility. Inter-dependency is not a new concept for Apple products (e.g. iPod/iTunes, Mac/MacOS) but the iPhone shows a level of inter-dependency with distribution and production the likes of which has never been seen. This topic will be further discussed at Asymconf in January as the fourth quarter data will then be available and there will be an opportunity to debate it live with an august audience. The database is neither current nor complete. If you would like to help maintain the data based on local (public) information, please get in touch and I can grant access to edit it.